to the harvest of disciple makers! The goal is that every believer, whether member or leader, would be able to train others. Hence why the training is called T4T- Training for Trainers. The training is broken up into 4 fields. What is our field-i.e. who do we share the Gospel with? How do we enter that field? Everyone has their personal fields (their own lost friends/ family/neighbors) and the church also has a field they want to minister in (the Japanese community in Atlanta). How will we share the Gospel in our fields? What bridges to the Gospel are present in Japanese culture? We decide what Gospel presentation we want to use, and then make sure every believer is competent in using it. Field 3: The Growing Field: Discipleship plan. This is where we decide short-term and long-term discipleship plans for new believers. EVERY believer is to be a trainer. That means that the people you train will themselves disciple whomever they lead to Christ. This allows multiplication of believers. 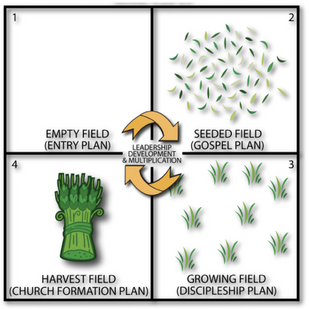 Field 4: The Harvest Field- Church formation plan. Once we have disciples, how do we form them in churches? Multiplication. These small groups of believers meeting to worship, pray, and read the Bible are the beginnings of churches. Even though they may never have a building, a 7-person worship team, a baptismal, or whatever other concept we have of church planting, they are simple and legitimate Biblical churches.